All around the world, people live in places where the threat of natural disaster is high. On the North Island of New Zealand, the Mount Ruapehu volcano is just such a threat. 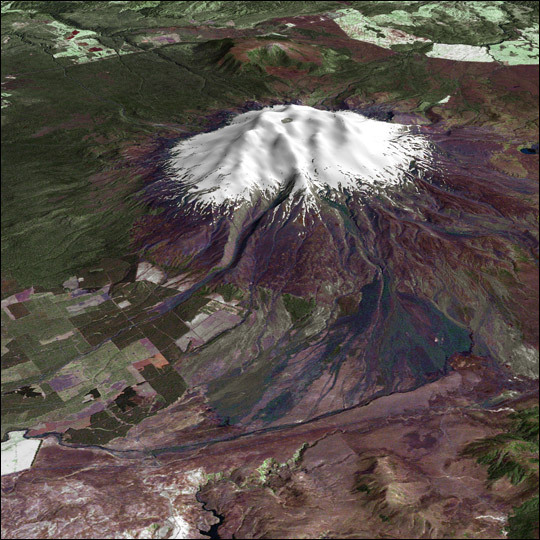 A towering, active stratovolcano (the classic cone-shaped volcano), snow-capped Ruapehu Volcano is pictured in this enhanced-color image. The image is made from topography data collected by the Shuttle Radar Topography Mission aboard the Space Shuttle Endeavour, launched on February 11, 2000, and imagery collected by the Landsat satellite on October 23, 2002. Ruapehu is one of New Zealand’s most active volcanoes, with ten eruptions since 1861. The eruptions aren’t the only threat from the volcano, however. Among the most serious threats is a volcanic mudflow called a lahar. In between eruptions, a lake forms in the volcano’s caldera from melting snow. If a previous eruption has deposited a dam of ash, rocks and mud in the lake’s natural overflow point, then the lake becomes dangerously full, held back only by the temporary dam. In this scene, the lake is nestled among the ridges at the top of the volcano. Eventually, the dam gives way and a massive flow of mud and debris churns down the mountain toward farmland and towns below. 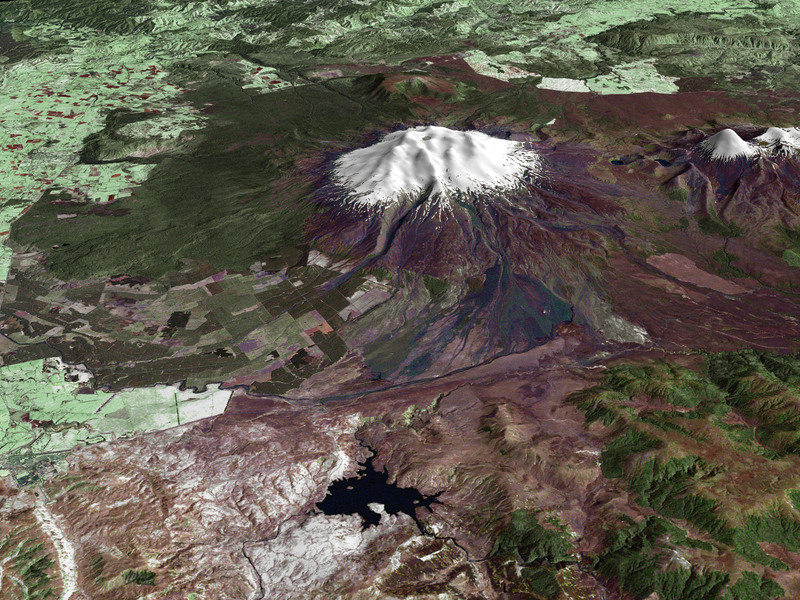 Scientists estimate that Ruapehu has experienced 60 lahars in the last 150 years. A devastating lahar in 1953 killed more than 150 people, who died when a passenger train plunged into a ravine when a railroad bridge was taken out by the lahar. The flank of the volcano below the lake is deeply carved by the path of previous lahars; the gouge can be seen just left of image center. Currently scientists in the region are predicting that the lake will overflow in a lahar sometime in the next year. There is great controversy about how to deal with the threat. News reports from the region indicate that the government is planning to invest in a high-tech warning system that will alert those who might be affected well in advance of any catastrophic release. Others feel that the government should combat the threat through engineering at the top of the mountain, for example, by undertaking a controlled release of the lake. Landsat data provided courtesy of the University of Maryland Global Land Cover Facility Landsat processing by Laura Rocchio, Landsat Project Science Office SRTM 3-arcsecond elevation data courtesy of SRTM Team NASA/JPL/NIMA Visualization created by Earth Observatory staff.